Our aesthetic services are designed to enhance and improve upon your natural beauty. We offer treatments suitable from your head to your toes. Our aesthetic experts use state-of-the-art equipment and safe, gentle treatment techniques. Today’s injectables provide a real opportunity for restoration of smooth skin and maintenance of a youthful appearance in a minimally invasive, safe and long-lasting procedure. Few people appreciate how much of their decline in wellness — including weight gain, loss of energy, hair loss and depression — is the result of hormonal imbalances. Your hormones can be brought back into balance through bioidentical hormone therapy services. Infusion IV therapy provides a much more effective and efficient method of providing your body with the nutrition that it needs. Our practitioners will carefully evaluate your needs before determining which infusion will provide you with the greatest benefit. Our unique approach to care addresses the whole patient, ensuring that both your medical needs and aesthetic desires receive the attention you deserve and the outcomes you want. DRC360 Med Spa is a full service treatment facility dedicated to offering state-of-the-art aesthetic and wellness treatments in a welcoming, caring, nurturing environment. Our highly skilled and attentive staff is committed to returning balance to our patients’ lives. We pay the same careful attention to your nutrition and overall health as to providing you with the most satisfying and transformational rejuvenation solutions. 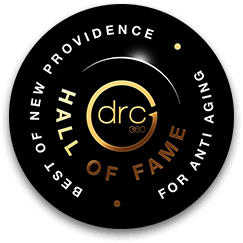 DRC360 is proud to have been recognized for two years in a row by the New Providence Award Program, which recognizes local businesses and entrepreneurs that have distinguished themselves through the customer service and dedication to community involvement. The doctor put me at ease immediately and upon leaving the office I felt assured he would help me feel better. His staff is extremely efficient and pleasant and I look forward to my follow-up. Very patient. Listened to my concerns and created a treatment plan that will hopefully work out well! He spent a lot of time with me and explained a lot as well. Dr. C is one of the best primary care physicians I have had to date. He truly listens to his patients and he - along with his practice of nurses and administrative associates - are incredibly accommodating should you have a last minute request to make an appointment, or even to reschedule. I have since moved out of the state - about an hour away - and am struggling to find a PCP that matches up to my experience with Dr. C (and so have continued to make the trip out to see him in the interim). I highly recommend him. This was my first visit, it was a very pleasant experience, the office looks great, the staff very pleasant and Dr. Cavazos accommodating, patient and experienced. I just found my new physician. Dr. Cavazos is a true professional. I was very comfortable talking to him and he is very knowledgeable and will be following his recommendation to treat my condition. Very friendly and efficent office staff. The office is modern and very clean. Dr. Cavazos is very friendly and knowledgable. He makes you feel comfortable right away and was very thorough during my routine check-up. Also, his office team is very organized and quick to inform and preemptively deal with any potential scheduling, insurance, or billing issues. Great experience all around. Highly recommend! I was in and out of the office in under 30minutes. The service was great, clean place and it was my first time visiting. I have never had a doc visit under 1 hour. I'm glad i had the rest of the afternoon to do other things. Great doctor who's very informative. Highly recommended.